When you're looking for the biggest selection of top-brand beverage equipment, draft beer, wine and water equipment, BeverageFactory.com is the place. With our Price Match policy you can be guaranteed of getting the lowest prices on the Internet! Plus finding the item you're looking for is simple and ordering is quick and hassle-free. Knowledgeable Customer Service Representatives are on call to answer all your questions. 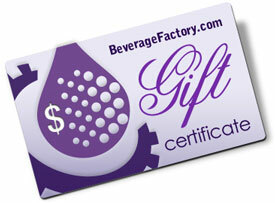 All gift certificates are shipped via USPS to ensure receipt of certificate. If you need an amount that is not available online, please call us at 1-800-710-9939.